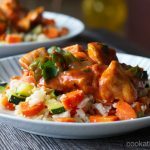 This Indian chicken curry has all the great flavors of butter chicken, but completely gluten and dairy free, even Whole30 compliant! Now my family, Henry in particular, is a big fan of butter chicken. So much flavor with all the Indian spices, it’s what he always looks for when we go out to an Indian restaurant. Even when we go to an Indian buffet, if there isn’t any butter chicken, Henry’s just not interested. So when he asked me to make butter chicken at home for one of our meals, I had to go searching for an option that didn’t include any butter … and one that would taste good. I happened upon this recipe from One Lovely Life and thought I’d give it a go. The first time I made this, I followed the recipe and used a slow cooker, but then thought I’d play around with it a little bit. And feedback from the kids was that it tasted really yummy, but it’s not butter chicken. 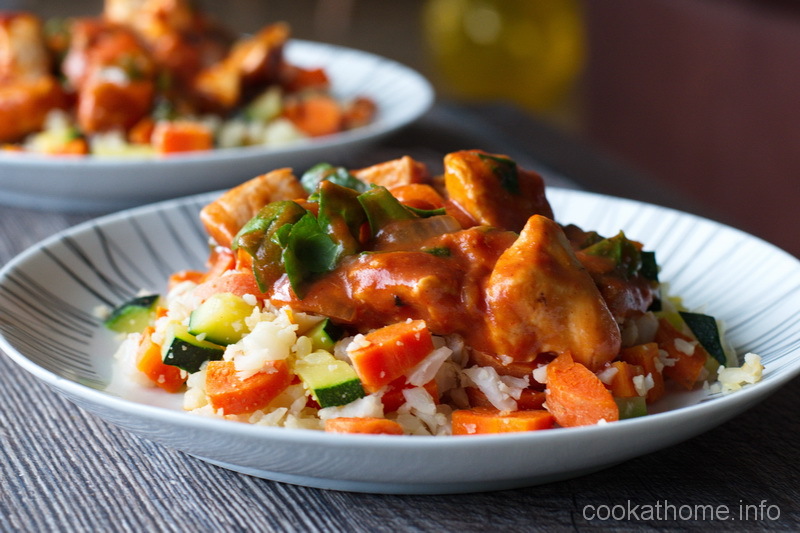 So I’m calling this recipe Indian chicken – so you can get the Indian flavors, but without the expectation of the specific butter chicken texture. Now I love to chock this full of veggies. And serve it over veggies – like my cauliflower rice. But you can serve it with normal rice, other veggies, or even Naan bread (or another type of flatbread) if you desire. And leftovers are amazing – the flavor just intensifies even more! 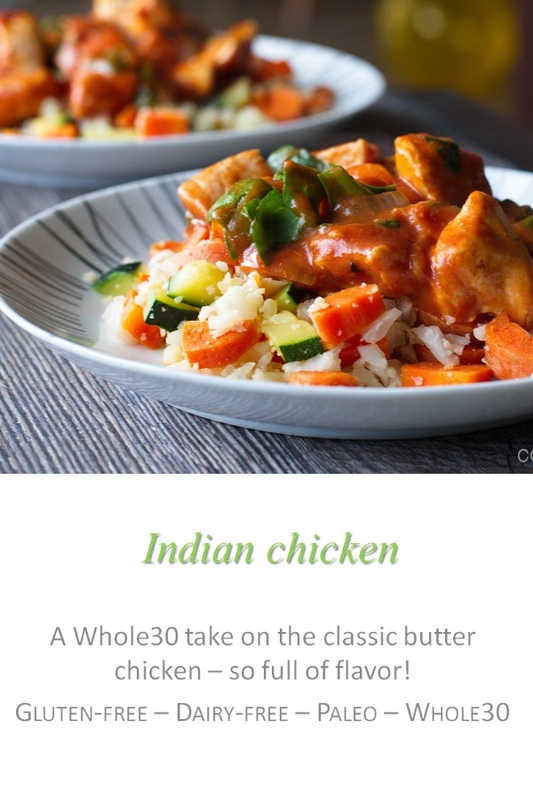 Give this Indian chicken curry a go – and let me know what you think in the comments! Heat oil of choice in a medium frying pan and brown the chicken pieces, possibly in two batches depending on the size of your frying pan. Remove the chicken from pan and allow to rest on paper towel. In a medium frying pan, saute the onion in the oil until translucent and soft. Add the garlic, ginger and spices. Cook for 1 minute longer until the spices become fragrant. Add the coconut milk and tomato paste and stir until well combined. Add the chicken back to the frying pan and simmer until desired thickness is achieved. Add in the spinach and squeeze the lime juice in just prior to serving.